If you’re following my Instagram account, you may have already seen my recent post with this classical dish! 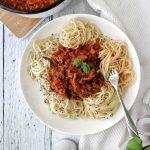 If I had to name the most typical dish I’ve had in my life, it’s probably this one: Vegan Spaghetti Bolognese! 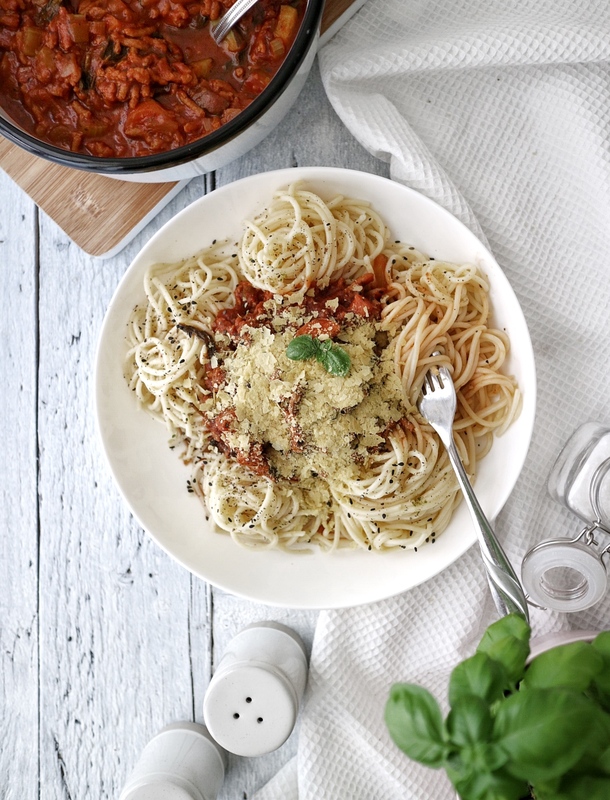 Both my parents have a love for Italian food, so Bolognese was a regular part of our shared weekend lunches and dinners – however not a vegan one, as back then even I wasn’t living the plant-based life yet. 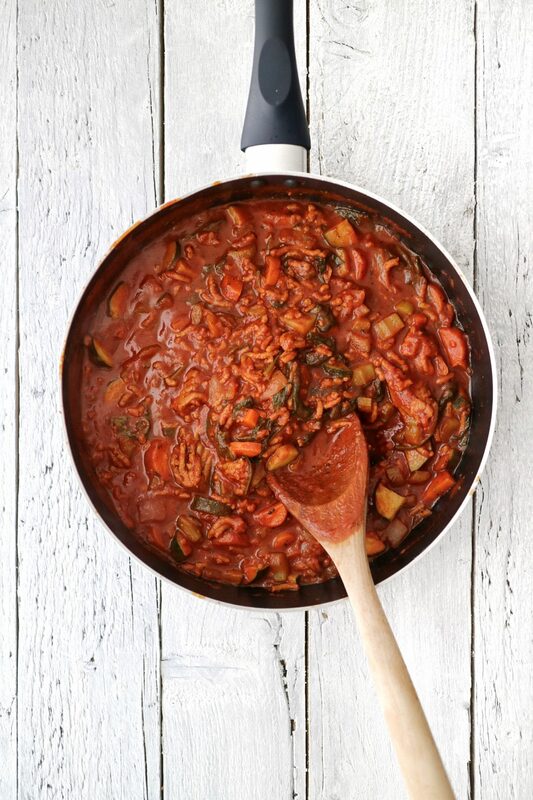 Throughout my years of being vegan I’ve made countless attempts at recreating the perfect vegan Bolognese, but ladies and gentlemen – I have to admit, up until now I’ve simply not been able to nail the distinct taste of Mum’s traditional Bolognese in a vegan version. And that’s the point, cause I am 100% certain I’ve finally gotten there! 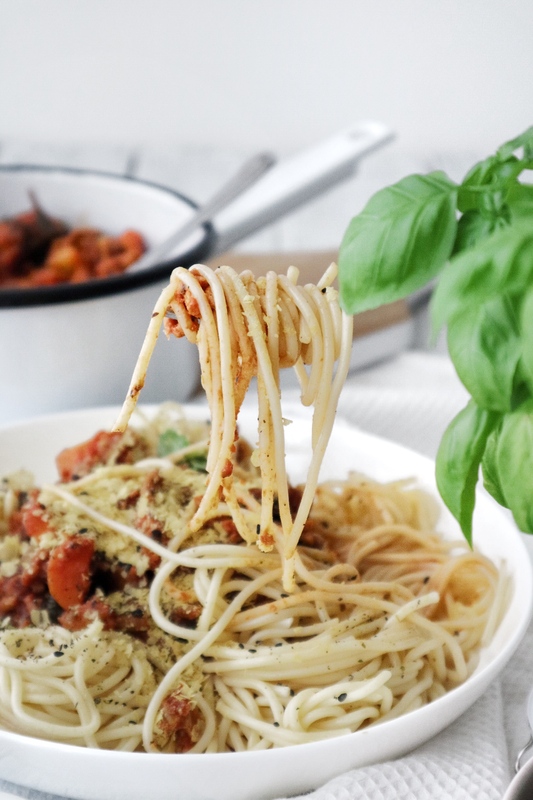 In a typical non-vegan family, Mum’s Bolognese was made to Italian tradition: with beef. 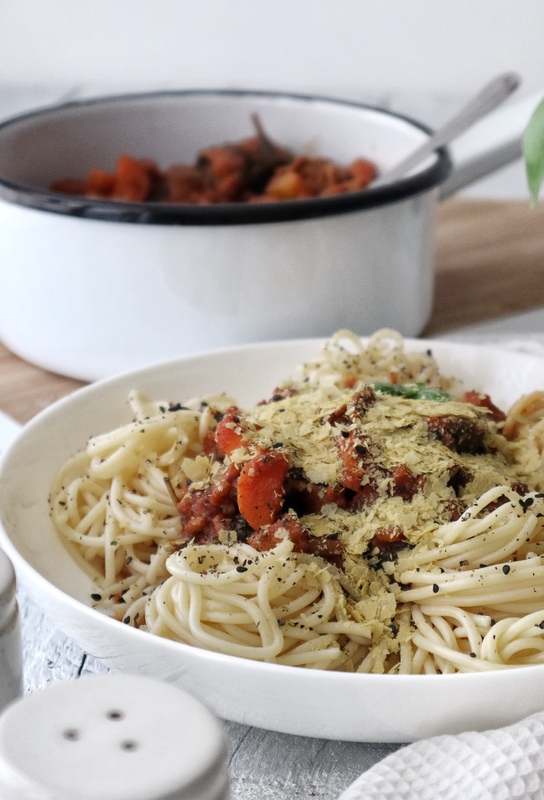 For my vegan version I therefore always knew: lentils & co make a delicious Bolognese, but it’s simply not the traditional flavour and texture that I long for when I crave a good old Spag-Bol. 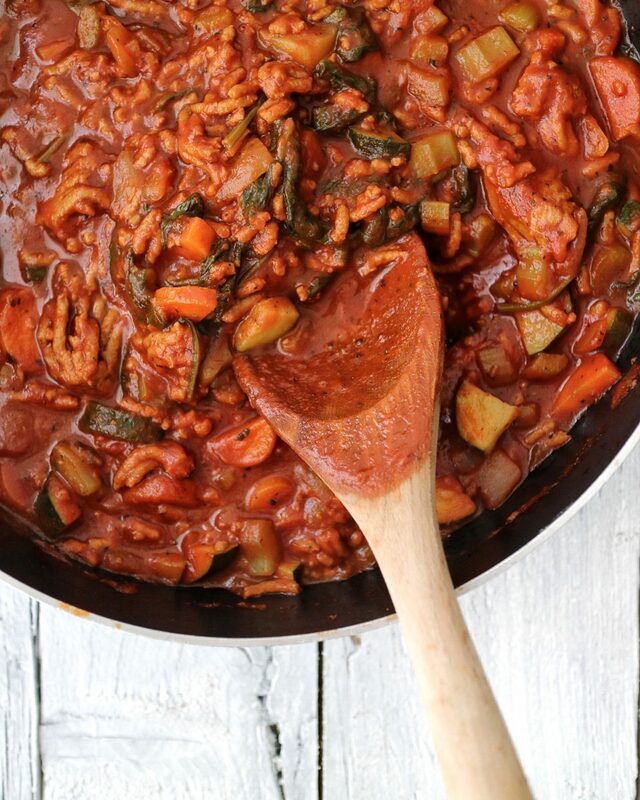 Earlier this year, the perfect replacement finally launched in the UK: Naturli Mince! You may have already seen in one of my previous blog posts (when I made a bangin’ Vegan Bic Mac). It’s made from soy protein and does not only look like mince (creepy, right?) 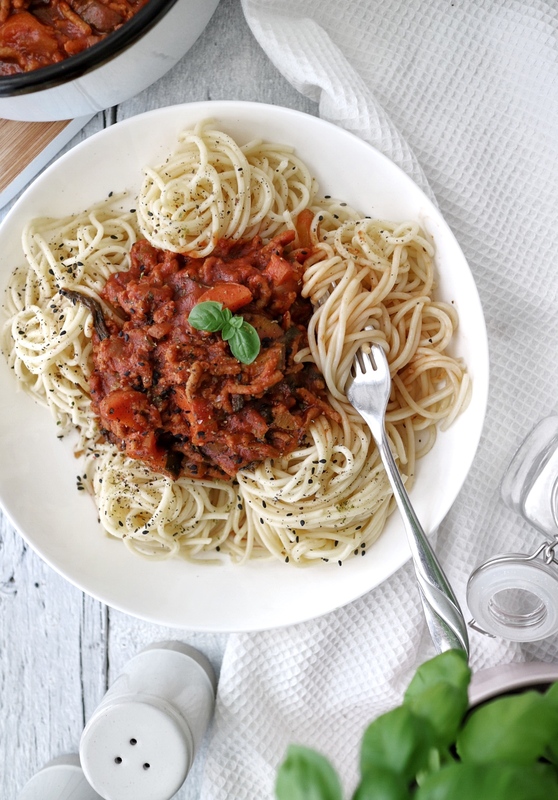 but also holds a great texture and flavour when used in this Vegan Spaghetti Bolognese recipe. It’s launched in the Sainsbury’s meat aisle earlier this summer – but not all Sainsbury’s might have it stocked. My own Sainsbury’s local doesn’t have it for example – and I myself have to travel a little further (to Chiswick to be precise) to get my hands on the mince and the burger. 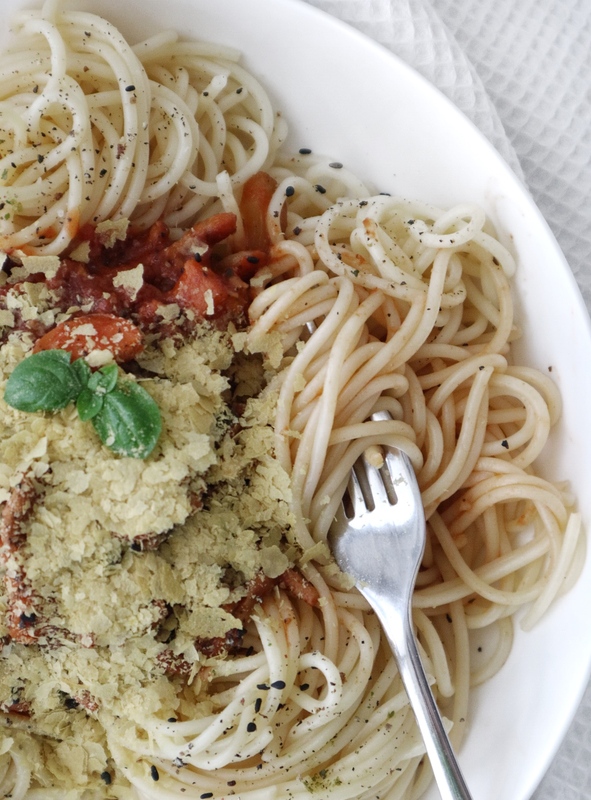 But oh well, that’s what I did, when I craved a good Bolognese, so you must know that this craving was truly an emergency, and funnily it actually came on a Sunday morning and this Vegan Spaghetti Bolognese was a late breakfast, ha! If you don’t have access to a Sainsbury’s that stocks this vegan goodness, you can also substitute with your favourite vegan mince. I also like the own-brand vegan mince that Asda offers, so maybe that could be an alternative option for you. 1. Start by chopping the carrots, courgette, onion and celery into bitesize chunks. If you’re not a fan of chunky onion in your Bolognese, you can of course finely chop it instead. 2. 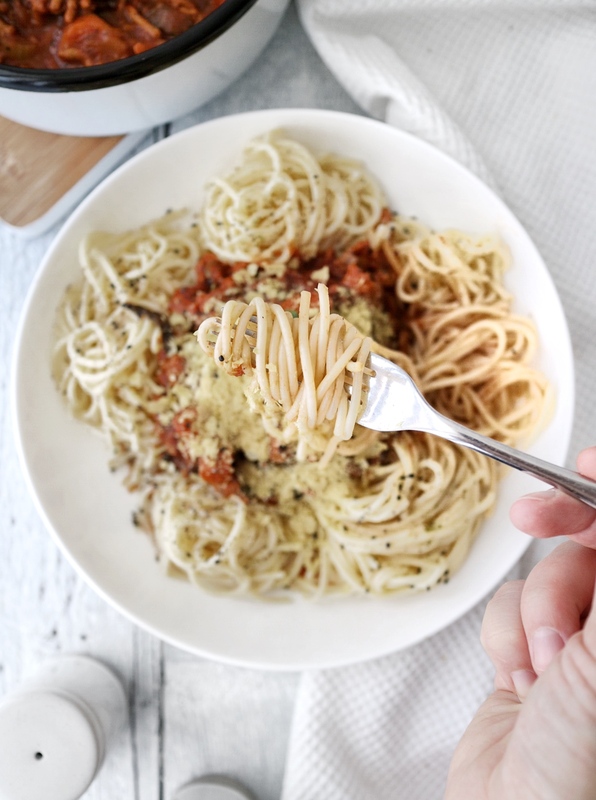 Cook the spaghetti according to packaging instructions and start on the sauce in the meantime: add the olive oil alongside the onion to a large pan on medium to high heat and fry until the onion starts to become translucent. At this point add the celery, courgette and carrot and fry for another 5 minutes. 3. Add the pack of Naturli Mince and break it down with a spoon. Fry it for about 5 minutes together with the veggies, stir regularly so it doesn’t burn, then reduce the heat to medium and add the spices. 4. Pour in the passata, then stir well. If the mince comes out a little dry, simply add a little water to the mix. Add the lemon zest & sweetener and combine well. 5. Cook for about 20 mins on low heat with the lid on the pan and stir occasionally. In the meantime your spaghetti should be cooked. 6. Assemble on your pasta plate! 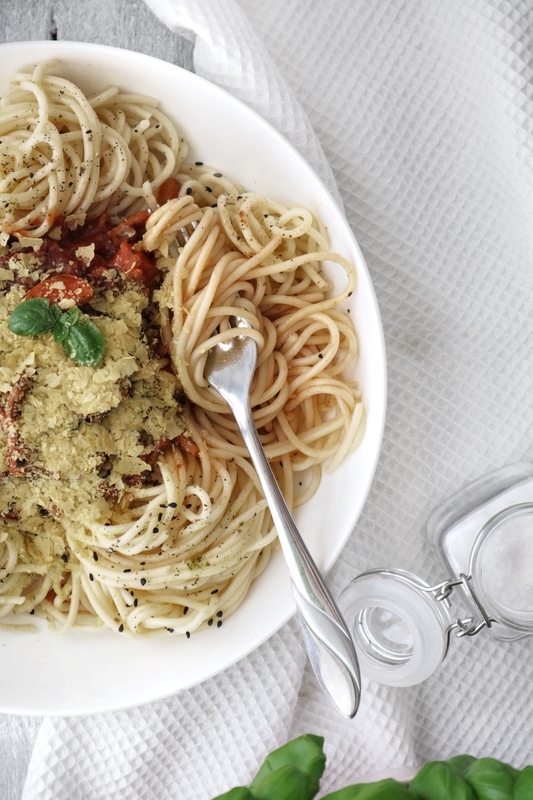 I personally love adding a little olive oil & some mighty nutritional yeast for a final touch! 7. Enjoy and watch the happy faces around the dinner table!